Lines and dots… that’s all a map really is. Lines and dots printed in tiny colors on sheets of paper that you can never seem to fold the same way twice. You don’t want to be seen with a map, else the locals pushing past you on the street mutter about annoying tourists under their breaths. So you try to be as inconspicuous as possible, shoving it quickly in your purse, backpack, briefcase, or pocket to avoid notice. The lines and dots are helpful, but can sometimes make you stick out like a sore thumb. It’s what the dots mean and where the lines go that make a map important. Consider the image below. At first, it doesn’t mean much. Can anyone guess where this is? If you guessed London, you’re right. It’s nothing but a series of lines and dots. In this case, the white and yellow lines signify roads. The blue windy line is the Thames. The dots here have numbers, symbolizing how many of my Facebook photos are tagged at different locations. A map can tell you so much, but there hits a point where its meaning is different for everyone. When you look at this image, you may see nothing but meaningless lines and dots. When I take a peek, though, I see memories playing in the back of my mind of my semester abroad. I picture myself walking through the campus of my host university, squeezing my way into a Tube train at Piccadilly Circus after attending the theater, and nipping in for a few minutes with my favorite paintings at the National Gallery. The lines are paths my feet have taken. The dots are places I’ve stopped to explore. Part of my heart aches when I look at the image, wishing desperately that I could be back in that place. A map can tell you all about a place, but it can’t tell you what it’s like to be there. It gives you facts, but not experiences. Great writers, though, can give meaning to maps with words. Most fantasy novels have maps at the beginning of them, giving a guide of lines and dots to follow and the story fills in the details. I don’t claim to be a great writer, so I’m not sure I’m able to give meaning to the map of London that I have shared with you. However, being an English major has introduced me to lots of great writers who know the city even better than I do. I have a complicated relationship with Virginia Woolf, but she gives you a pretty good idea what London is like in her novel, Mrs. Dalloway. There. Do you feel it? For a moment, you were right there with Clairissa Dalloway, Virginia Woolf, and me, walking the streets of London and basking in the bustle of life. Do you have any maps with special meaning? What places are most special to you and why? This post is inspired by an assignment for the Blogging University class Writing 101: Finding Everyday Inspiration. There are days when I long for London. I grew up (and attended college) in the country, but man… London has wedged its way into my heart. When I left, its loss was searing. I couldn’t go a day without longing to be back. The longer I’ve been away, though, the more life conceals my love of England’s capital. It’s like a piece of gold buried in my heart that is buried more every day. Out of sight, out of mind–as they say. But then, suddenly, it all comes back. I remember the feel of my feet on the pavement. The splatter of rain on my umbrella. The sound of people of every age and color jostling for a place to stand on the Tube. The twitters of excitement as the curtain draws at the start of a West End show. The laughter of kids on field trips in art galleries. Dogs barking in Hyde Park. Red double-decker busses lumbering through the city. Eager shoppers flocking on Oxford Street. The warm laughter coming from pubs. The musty scent of books haphazardly stacked floor to ceiling in the stores on Charing Cross Road. The clang of Big Ben. The elegant statues of Whitehall. As the memories flood back, I’m overcome with longing. To love London is to love life. Will I ever be back? It’s been a long haul this semester. We’ve been through a lot together, you and I. But I think it’s time that we go our separate ways. It’s not you. It’s me. Okay, that’s not true. It’s totally you. I think it’s time we break up. Our first meeting, way back in my Brit Lit II survey course, went exceptionally well. You sure do know how to make a good first impression. Thus, I was optimistic. But then our relationship turned out to be rockier than I expected. Your short fiction had me stumbling about like a silly lady trying to figure out what was going on. But I attributed that to your innovativeness, and that I just had to get used to it. Then there was Jacob’s Room. Ugh. It wasn’t all thistles and thorns, though. We had some good times, Virginia. We really did. We were reading Mrs. Dalloway on February 14th and you were my Valentine. That book took my breath away. It had me singing stupid love songs, declaring my passion to the skies. For a while, Virginia, I thought there was no hope. I thought we were doomed to fail, you and I. But then Orlando came along. I sat there thinking, “I didn’t know Woolf could be funny!” And you were! You were downright hilarious! If you could go back, I encourage you to do more work like Orlando. It’ll bring more joy to the world. Ultimately, though, you slaughtered me with The Waves. What on earth were you thinking? Why was that a good idea? I didn’t understand a single bit of it. And oh my goodness, my professor’s lectures on it only made it worse. Was it your goal to make a book that’s absolutely impossible to comprehend? Because if so, you definitely succeeded. What is the price of your success? My happiness. My hope. My joy. My dreams. My will to continue our relationship. You sacrificed those things by choosing to write The Waves. So, Virginia, it’s been a bit of a rollercoaster. And, frankly, I think it’s time we take a break from each other. Some time and distance will help strengthen our relationship. You wrote some things that were pretty miserable to read and I don’t know if I’m ready to forgive you. Don’t worry, though, I’ll come back to you someday. I still remember the way my heart raced as Mrs. Dalloway exclaimed “What a lark! What a plunge!” There is good to be found, Virginia. So take heart. I’ll be seeing you eventually. Until then… I think I’ll spend next semester hanging out with the Victorians. Charles Dickens and I have some catching up to do. I’ve been meaning to do a “Friday Favorites” section for AGES. But life, like it always does, keeps preventing it from happening. On a Thursday afternoon, I’ll remind myself to come up with something… only to forget. Or, I’ll think of it on Monday… which is not very helpful. Now, though. Now I’m going to make it happen. Without further ado, here are my Friday Favorites! 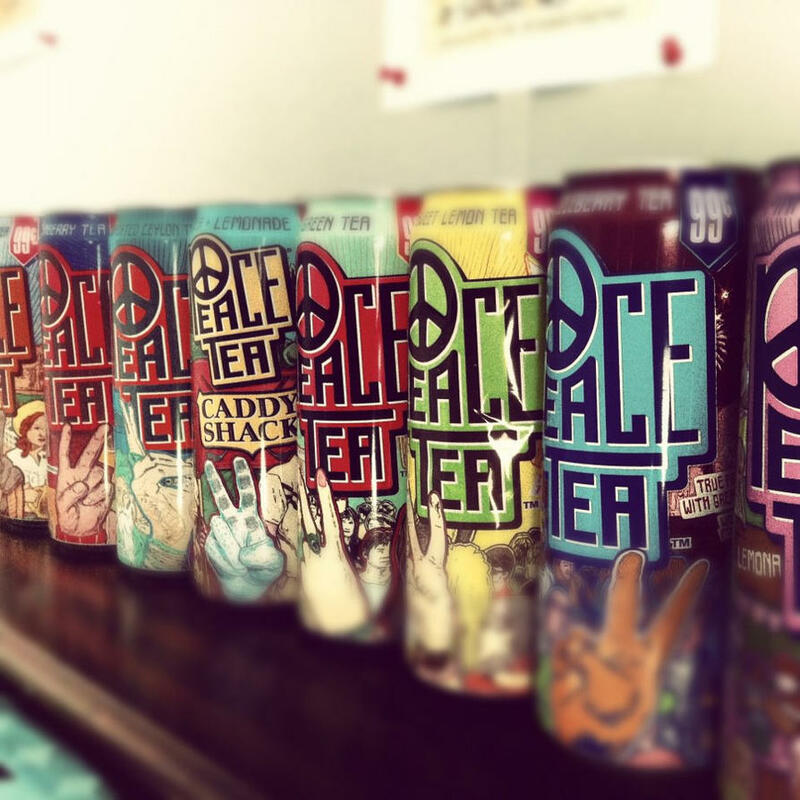 For only 99¢, Peace tea is a worthwhile investment. It’s basically what I survived on sophomore year. (Dining dollars well spent? I think, yes.) I managed to wean myself off of them after a while, but still pick one up every once in a while when I’m out grocery shopping. My favorite is the Razzleberry, but I recently discovered the blue Sno Berry flavor, which is also fabulous. I just finished reading Mrs. Dalloway for the second time this week. It is a breathtaking portrait of a day in London after World War I. Having spent time in the city, I felt like I was right there–standing in a crowd outside Buckingham Palace, cruising up the Strand atop a bus, crossing Victoria Street… “What a lark! What a plunge!” How Woolf manages to capture all the beauties and complexities of a single day astounds me. I could ramble on and on about all the aspects of the book that I love, but I’ll let you discover those for yourself. Still… I could read this novel once a year for the rest of my life and still not fully comprehend all of its elements. Bath, England. They just don’t make cities like these in America. The lovely Georgian architecture, stunning cathedrals, old bridges, and ancient Roman bath houses… it’s like walking backwards into history. Because it’s a World Heritage site, it looks pretty much the same now as it did in the 1700’s. Plus, Jane Austen lived here… which is pretty much fabulous. I want to do is hop in my car with all my friends and sing at the top of my lungs. It’s all I’ve been listening to for the past week.